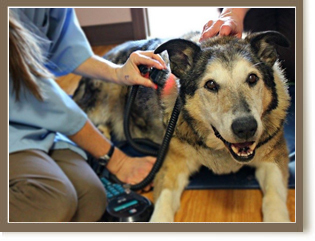 Attleboro Veterinary Clinic is excited to introduce Cold Laser Therapy! This technology is an excellent non-invasive therapy option for many conditions from which pets suffer, including arthritis, other forms of inflammation, and wound healing. 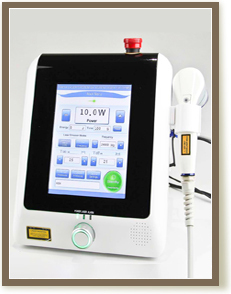 The cold laser is simply a beam of special wavelengths of light that is applied to the surface of the skin. It is NOT a thermal or ‘hot’ laser; therefore it does NOT cut tissue like laser surgery. These special light waves actually interact with cells, creating beneficial changes in them and energizing them, leading to healing and reduction of inflammation. Increased metabolic activity is observed within the cell which leads to faster healing, reduced inflammation, less scar tissue formation, increased oxygen to blood cells, increased production of specific enzymes, nerve stimulation and greater metabolic activity. Depending on the pet’s specific condition, we will give you a recommendation as to how many initial sessions are needed to see a response. The sessions simply consist of a comfortable visit to our clinic, averaging 15 minutes, where a light probe is applied in a particular way by one of our trained and certified staff members to the specific body part that needs treatment. You, the Pet Parent, can choose to keep your pet company throughout the session! It especially seems to be very helpful in older pets with arthritis where it can be super helpful with pain reduction and helping them to walk better; it can be used in addition to our usual anti-arthritis medications or in place of them in some cases such as when they cannot safely tolerate the meds. It also is very helpful in speeding up the process of wound healing so we are going to be offering it as an option for our surgery patients – to receive a treatment right after the surgery to help them heal more quickly. In addition, Cold Laser has been used successfully for many other conditions regarding which we can advise you. As with any treatment, it doesn’t work on every single patient but it works well on enough patients to make it very worthwhile to try, and it’s an exciting addition to our spectrum of treatments!